Several stories have reported that 1984 is being read, or at least bought, again, becoming an unlikely best seller. This is ambiguous news at best. The book is sophomoric enough to deserve its place on every high school's sophomore's reading list. Its politics are dubious, and its philosophy is even worse, its picture of a totalitarian society based on hate and universal deception always seemed more of something to reassure members of liberal capitalist society that everything was alright in their society than a warning. There is thus something amusing about this particular chicken coming home to roost, of cold war ideology become the basis, however, impoverished of a critique of ideology. It just so happens that I taught this book last fall in a Freshman seminar on Utopia and Dystopia. A few things occurred to me in reading this book. First, the books central statement regarding propaganda, The Ministry of Truth, seems quaint and archaic by today's standards, the idea that newspapers would be edited and changed to reflect new correct ideological positions seems inefficient, costly, and cumbersome compared to delete tweets and edited websites. Controlling the present, and with it the past and the future, has gotten to be as simple as the delete key. The ministry of truth has nothing on the perpetual present of twitter. "In past ages, a war, almost by definition, was something that sooner or later came to an end, usually in unmistakable victory or defeat. In the past, also, war was one of the main instruments by which human societies were kept in touch with physical reality. All rulers in all ages have tried to impose a false view of the world upon their followers, but they could not afford to encourage any illusion that tended to impair military efficiency. So long as defeat meant the loss of independence, or some other result generally held to be undesirable, the precautions against defeat had to be serious. Physical facts could not be ignored. In philosophy, or religion, or ethics, or politics, two and two might make five, but when one was designing a gun or an aeroplane they had to make four. Inefficient nations were always conquered sooner or later, and the struggle for efficiency was inimical to illusions. Moreover, to be efficient it was necessary to be able to learn from the past, which meant having a fairly accurate idea of what had happened in the past. Newspapers and history books were, of course, always coloured and biased, but falsification of the kind that is practiced today would have been impossible. War was a sure safeguard of sanity, and so far as the ruling classes were concerned it was probably the most important of all safeguards. While wars could be won or lost, no ruling class could be completely irresponsible." One is reminded here of Muhammed Saeed al-Sahhaf during the second Iraq War, whose press briefings became increasingly disconnected from reality. However, it is precisely this idea of some kind of non-ideological outside, some force of physical reality that would in and through itself rupture propaganda, that is one of the books many failings. Orwell acknowledges that even war loses its epistemic value once it becomes a series of skirmishes in distant lands. The wars in 1984 last forever, never contesting or confirming ideology. One could say the same thing about our current wars, on terror, drugs, etc., There are no decisive battles, no captures of cities or Normandy invasions to function as facts, just endlessly competing narratives and interpretations. One could extend this point to various other crises, as much as one might hope that "global warming" would function as another ideological puncture, as long as there are cold days in January and paid lackeys of the fossil fuel industry, it will be endlessly debated. More to the point, Orwell's analysis is a failure to understand how ideology works, how it functions not just as a series of ideas imposed, but as a common sense, or to use another philosophical vocabulary, as a lived experience of the imaginary. Ideologies succeed in and through their ability to convert supposed facts into part of their narratives. This is another way in which Spinoza can be considered the anti-Orwell. 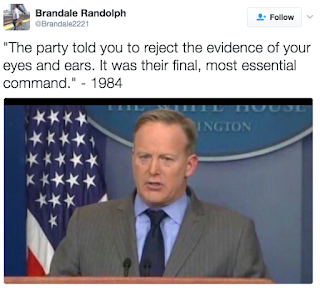 This is the problem of reading, or rereading 1984 today, it hinges on the belief that the current regime of fantasies inhabiting the White House, can be confronted with some fact, some evidence that will puncture its hold. If such a thing were to happen it already would have happened. The existing policies, border walls, protectionism, militarization of police, are all hopelessly disconnected from existing realities of immigration, economics, and urban life, almost constituting a reverse bizarro world of the world we live in, yet they go on. There is no war, no fact outside of proganda to impose its sovereign force, or, more to the point, the only war is the war within and against ideology itself.